When you’re convinced that dust mites are causing all the allergies that you’re suffering, you’ll be desperate for a solution. One often overlooked method in killing dust mites is the use of diatomaceous earth. You may not be familiar with what diatomaceous earth is, but this powdery substance is as natural as it gets in busting dust mites. Diatomaceous earth or DE is a powdery compound derived from the fossilized remains of miniature aquatic algae known as the diatom. The remains of the miniature sealife often transcend 100,000 years and are easily broken to fine white powders. While the term diatomaceous earth can be rather alien, you may have used or come across with diatomaceous earth in daily life. The high concentration of silica in diatomaceous earth makes it a sought-after component for both industrial and commercial purposes. Some common applications of diatomaceous earth include water filtration, food production, skin products and a good agent in pest control, including dust mites. Does Diatomaceous Earth Kill Dust Mites? Diatomaceous earth is a lethal agent for pests shaped with an exoskeleton, such as dust mites. The tiny powder has sharp edges which tear into the protective layer of dust mites exterior. It then dries out the organism upon contact and once the dust mites are void of fluid, they are exterminated. The effectiveness of diatomaceous earth for pest control has been proven in a study conducted by the University of British Columbia. Laying hens that are dusted with diatomaceous earth has shown a significant reduction in Northern fowl mite infestations. As a natural agent, diatomaceous earth may take a few days before it eliminates the dust mites infesting your home. 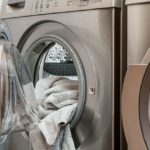 You’ll also want to take note that diatomaceous earth will not work on the eggs of dust mites, which means you’ll need a continuous effort in keeping dust mites under control. When using diatomaceous earth, it’s important to find out if it’s safe for humans and pets. That’s because there are two types of diatomaceous earth that are available, i.e., the crystalline vs non-crystalline. Crystalline diatomaceous earth is widely used in industrial applications. This filter-grade diatomaceous earth powder contains a high amount of crystalline (>60%) and is found to be harmful to health. When inhaled on a consistent basis, it can increase the risk of lung cancer as found in this study. If you’re using diatomaceous earth to killing dust mites in your home, you’ll want to choose food-grade or non-crystalline diatomaceous earth. It contains less than 2% of crystalline and is approved by the FDA for usage in food and agricultural applications. With that said, you should take precaution when using food-grade diatomaceous earth. It has been suggested that inhaling diatomaceous earth can be linked to lung irritation and potential scarring of the lungs. You can use diatomaceous earth to eliminate dust mites in your home. It’s particularly effective for the mattress, carpet, mats and other fabric-covered items. Follow these steps and you can keep dust mites infestations under control with diatomaceous earth. Ensure that you’re using food-grade diatomaceous earth. Wear a face mask if you are known to be sensitive to allergens. Sprinkle the diatomaceous earth on surfaces that may be infested with dust mites. Leave the diatomaceous earth for a few overs before removing the powder with a vacuum cleaner. You’ll want to repeat the process for a few weeks to reduce the growth of dust mites at home. Of course, diatomaceous earth shouldn’t be the only solution that you applied to reduce dust mites. It works well when incorporated in part of your cleaning routine at home. 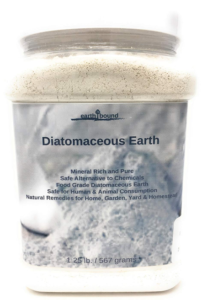 Diatomaceous earth can be perfectly safe, or harmful for humans. 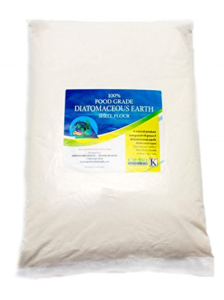 It all depends on if you’ve made the right choice when choosing a diatomaceous earth product. Consider the following factors and you’ll avoid causing any harm except to the targeted dust mites. Use Food Grade Diatomaceous Earth – Avoid crystalline diatomaceous earth and choose the food-grade variant. Food grade diatomaceous earth is safe for pets and humans while effective for killing dust mites. Purity – It’s equally important to ensure that no artificial additives are added to the diatomaceous earth. Packaging – You’ll want to choose diatomaceous earth that is supplied in convenient packagings, such as a resealable pouch. 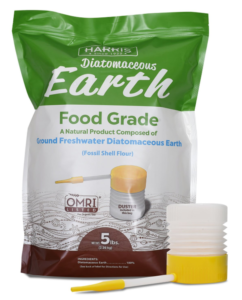 There are some local health stores that sell food grade diatomaceous earth. Alternatively, you can purchase it from online retailers, such as Amazon, and save the trouble of commuting and searching for diatomaceous earth. You don’t want to make mistakes when getting diatomaceous earth to counter the dust mites infestations at home. Quality and safety matters. I’ve narrowed down the choices to these and I hope it makes your decision easier. With dust mites growing rampant in your home, you’ll need an effective and safe food grade diatomaceous earth, such as this product by Harris. It contains only pure freshwater diatomaceous earth without any additives added on. The diatomaceous earth was mined in Nevada and later packed in a facility in Georgia. Any questions on its safety are further addressed by its listing with OMRI, an independent organization that reviews and supports the organic integrity of products. There’s no issue in storing the diatomaceous earth after sprinkling them on the mattress and carpet as it is contained in a resealable pouch. Besides, you’ll also find the powder duster supplied alongside handy when applying the fossil powder. The powder duster may make a mess. This diatomaceous earth by Fossil Power is derived from one of the only four food grade suppliers in the US. It is safe for humans and pets but effective in killing dust mites at home. All you need is to sprinkle a liberal amount of the powder in likely dust-mites infested areas. You don’t have to worry about ingesting some of the diatomaceous earth in the process as it is packed in an FDA-approved facility, OMRI-certified and contains no harmful components. It’s even safe to be used if you have pets at home. 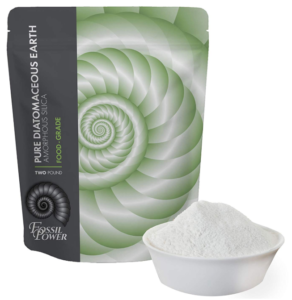 Using and storing the diatomaceous earth is easy as it is packed with a resealable pouch. It prevents exposure to moisture which may dampen the fossil powder. Sourced from food grade diatomaceous earth supplier. The powder may cause a mess when not opened with care. There are four food grade diatomaceous earth deposits in the US and this DE by Root Naturally is sourced from one of them. Not only is it of pure origin, but only stainless steel equipment is used during the packaging process. This ensures that the powder is not compromised during manufacturing. 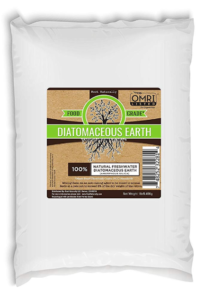 The diatomaceous earth is also listed with OMRI, making it safe to be taken as a supplement. But what’s crucial is its effectiveness in putting the dust mites invasion in your home under control. As it does not come in a friendly-packaging, you will need to store it away from moisture after using the powder. Sourced from natural food-grade diatomaceous earth deposit. Packed with stainless steel equipment. Not packed in a resealable pouch. The Earth Bound food grade diatomaceous earth comes in a nice container that allows storage after use. The fine fossil powder is effective in aiding your battle against the dust mite in your home. Just sprinkle the powder over places like carpets and mattress to eliminate the unseen pests. As a natural insecticide, it is certified by OMRI to assure its safety when used as an organic ingredient. The diatomaceous earth is produced without any additional chemicals or additives, making it safe around kids and pets. This high-quality diatomaceous earth may just be the difference in eliminating dust mites in your home. Stored in a plastic container. Pure food grade diatomaceous earth with no additives. The label does not show states as organic while the manufacturer claims so. 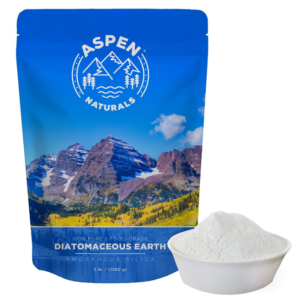 Beneath the pretty packaging is a high-quality food grade diatomaceous earth produced by Aspen Naturals. Its purity is assured as it was derived from a food grade diatomaceous earth deposit located in the US. As such, it is high in silica and other minerals. This diatomaceous earth is safe for humans and pets, but the same cannot be said for dust mites. As you sprinkle the fine powder on your beddings, you’re sending the millions of dust mites to a slow doom. Besides, the powder may also remove any odor emanating from the bed. Sourced from a food grade diatomaceous earth deposit. Fine powders may fly all over when you unzip the pouch. Not all diatomaceous earth is safe for humans and pets. 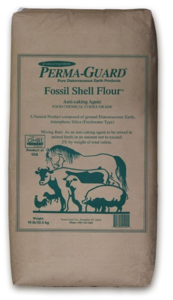 You’ll want to ensure that the diatomaceous earth you’re using is sourced from one of the only four food grade deposits in the US, such as this fossil flour by Perma-Guard. It has been certified by OMRI, which means that it’s suitable for organic use. The fine powder has zero concentration of impurities making it lethal for dust mites but safe for humans. You can keep the dust mites infestation in your room under control with this premium diatomaceous earth. Available as a 50lb pack, it’s ideal when you have a large surface of dust mite infested area. Natural food grade diatomaceous earth. Large pack for a large area. Some customers received a broken pack. Not a fan of paper bags when it comes to diatomaceous earth packaging? Earthworks Health packed the fine fossil powder with premium sealed plastics to ensure no moisture exposure. But packaging aside, the diatomaceous earth you’re getting is of food grade, organic and kosher. Diatomaceous earth is one of the most potent natural insecticides and sprinkling the fine white powder in your home will help to keep dust mites infestation under control. You’ll want to use it at least once a week as it takes a while to kill off the dust mites. Sealed to prevent liquid exposure. Effective in getting rid of bugs. The non-resealable bag can be messy for some. 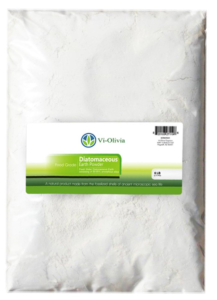 If you’re worried about harming your cats and dogs when killing dust mites, you ought to use this non-toxic diatomaceous earth by Vi-Olivia Organics. It is sourced from the purest food grade deposits and underwent gentle processing to ensure its efficacy. The diatomaceous earth that you’ll get will be almost white in color, indicating that it contains no impurities such as the grey variants of the powder. As crystalline is harmful to human, the fossil powder supplied contain less than 1% in accordance with regulations. Derived from purest food grade diatomaceous earth deposits. Gentler processing for increased efficacy. The non-resealable pack can make a mess in your home. 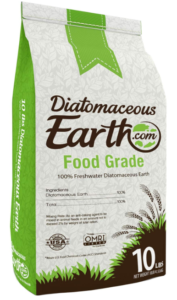 You can’t get anything better than this freshwater food grade diatomaceous earth by DiatomaceousEarth.com. As the name implies, the company is established and fully devoted to sourcing and producing the highest quality of diatomaceous earth. When you get yourself a pack of this white fossil powder, you’re getting the assurance of diatomaceous earth that meets all the regulations imposed by the FDA. It is produced in accordance to a stric procedure that results in a superior product compared to its peers. Complies with all FDA regulations. Processed with stainless steel equipment. The packaging may cause the powder to fly around. 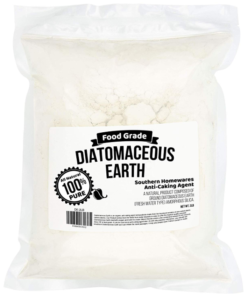 You can put an end to the dust mites terrorizing your home with this food grade diatomaceous earth by Southern Homewares. It is both organic and food grade, making it safe when your children and pets are around as you sprinkle the powder. The fine fossil powder is packed in a resealable back which means you don’t need a clip after usage. It doesn’t come with a powder duster but you can purchase it from the same supplier to make applying the powder easier. Organic and pure food grade diatomaceous earth. Effective in getting rid of pests. Some people feel sprinkling the powder is messy. So, you’ve sprinkled the diatomaceous earth for a few weeks and the allergies has subsided. It’s a sign that the dust mites population has been reduced drastically. But you’re left with half a pack of diatomaceous earth. Should you dispose of, store or is there any usage of the fossil powder? 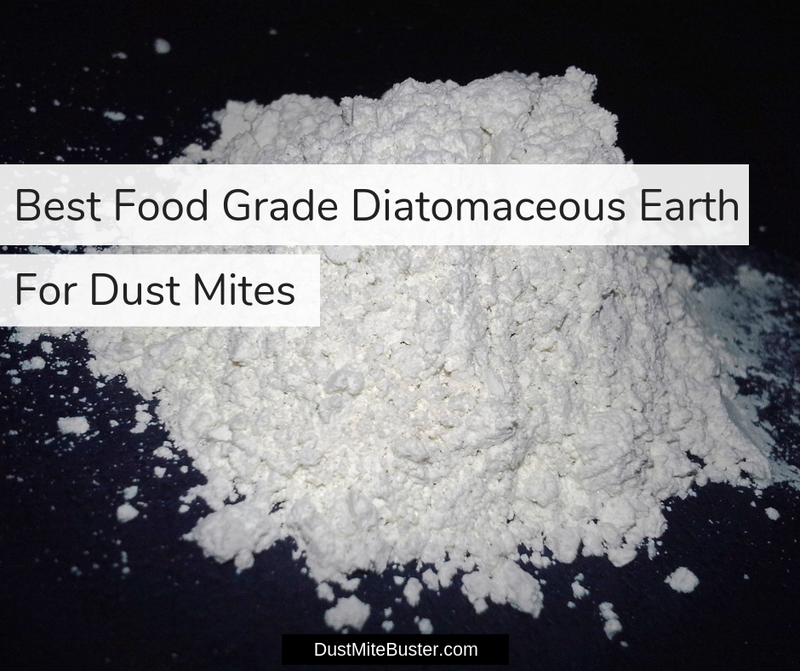 Here are what you can do with food grade diatomaceous earth apart form killing dust mites. Consume for body-detox – You can ingest food grade diatomaceous earth according to the recommended dosage to help detoxify your body. It’s been suggested that taking a single teaspoon on an empty stomach helps to clean and remove toxins from the body. Promote bone health – While more research is needed, taking diatomaceous earth has been linked to promoting bone health. This is on the basis that the silica aids the creation of collagen, which is much needed as we age. Clean and smoothen skin – Sprinkling diatomaceous earth on your skin helps to maintain a healthy and smooth complexion. The properties of the fossil powder act to remove toxins found on your skin. Experience tells me that it takes time, effort, and patience in trying out various methods to keep the dust mites under control. I hope the food grade diatomaceous earth listed above helps you in getting rid of the dust mites that are infesting your home. My son had a very nasty , itchy, reddy, skin allergies when he was about 10 . The doctor can’t pin point what is causing his nasty skin irritation , I have tried every other ointments and soap in the world but did not work,until I changed his bed , mattress and sheets that is when he got better.Looking back in retrospect, that would probably dust mites causing his allergy. Reading your website it has given me a better perspective and information about this nasty little creatures had no idea to deal with in the past. Very informative website. Thanks for sharing . Thanks for checking out the article. I’m glad it helps in managing your son’s allergy. Thanks, Kenny for such an informative article I’ve been looking for a quick and effective solution for dust mites and you just gave me a number of options to choose from. Thanks for the product links too. I’m glad the article helps.